When is the next Messy Church? Rev. Jacqueline Drake-Smith is now our new Vicar. 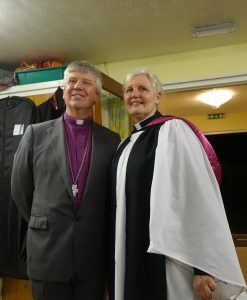 Rev Jacqueline’s collation (presentation, admission and institution) by The Right Reverend Andrew Watson, Bishop of Guildford and installation by the Venerable Paul Davies, Archdeacon of Surrey, took place on Tuesday 13th March. Rev. Jacqueline and her family were welcomed by members of St. Peter’s Church and the local community at an uplifting service on Tuesday evening in a full church. It was lovely to listen to the joint choir’s of St. John the Evangelist, Merrow, and St. Peter’s Wrecclesham, singing in welcome, and also a choir of children from year 5 and 6 at St. Peter’s School. After the service Rev, Jacqueline and her friends from Merrow joined members of St. Peter’s Community for refreshments. We now look forward to Rev. Jacqueline leading us in our worship and service in Wrecclesham. April Letter from Rev. Jacqueline. St Peter’s church stands at the heart of Wrecclesham offering in Christ's name a warm welcome, faithful witness and loving service.